You see the IDE. Most IDEs provide some type of Start tab. The Start tab can contain a number of items, but most include a list of your previous projects and any news about the IDE you’re using. You see the New File dialog box. IDEs usually provide some method for creating new files. This technique creates an individual file. If you were working on a site that contained many files, you would create a project as a starting point instead. 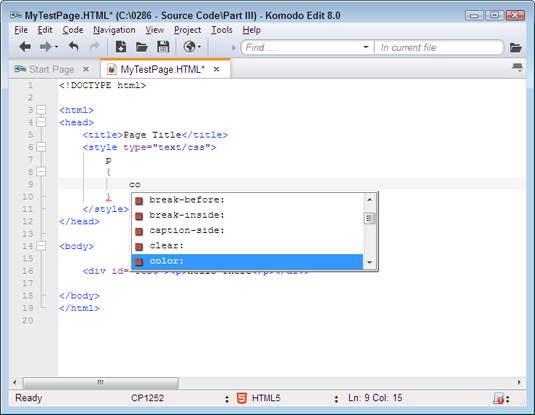 Select Common in the Categories list and HTML5 in the Templates list. Type a name for your file, such as MyTestPage.HTML. Choose a location to store the file in the Directory field (as required). Click Open. You see the new file opened. 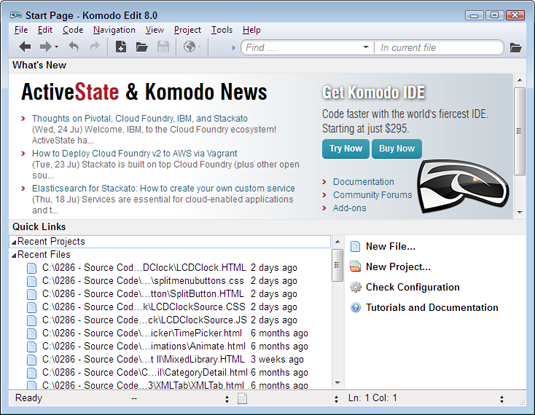 An IDE uses templates to start the file content for you. 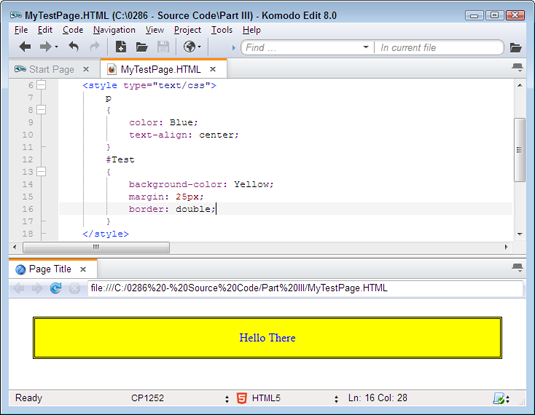 The amount of content the IDE provides depends on the template and the kind of file you create. 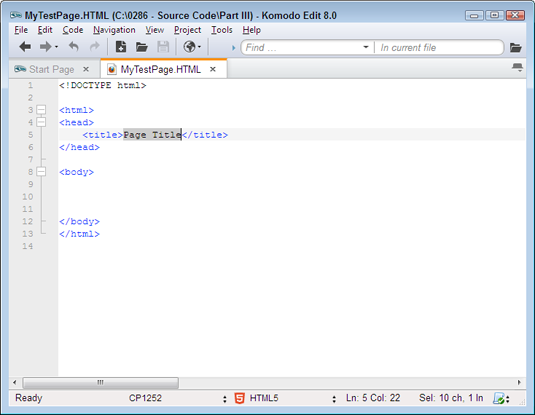 An HTML5 template typically contains the declaration, heading, body, and title. Create content to display on screen. For example, type <div id="Test"><p>Hello There</p></div> to create a message within a paragraph that exists within a <div>. You see tag-specific help information provided by the IDE. An IDE typically displays helpful information about what to type next. These helpful tips make it easier to create useful code in less time and with fewer errors. Type any CSS required to format the content. Save your work after each code addition. You see CSS-specific help information provided by the IDE. 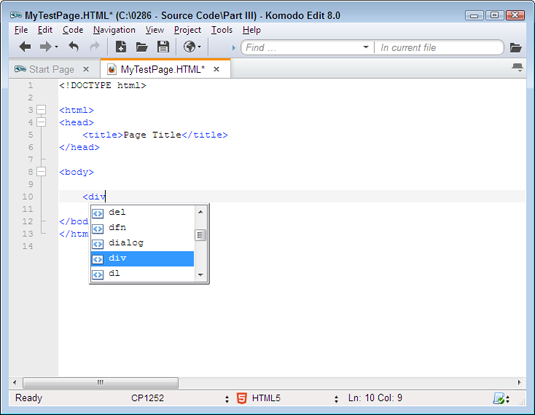 As with the tags, the IDE also provides information about the CSS you type when it can. The CSS information is more detailed and usually provides input such as the allowable values for many properties. 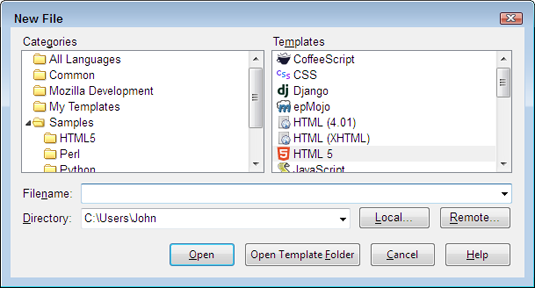 The IDE displays a dialog box asking what you want to see and how you want to view it. An IDE will typically provide some means of viewing your work. You should use this view as a starting point. However, it’s important to view the work in the target browsers for your application as well. Choose the Preview with This File option when you see the Preview dialog box and click Preview. You see a preview of your page as it will appear in the browser.